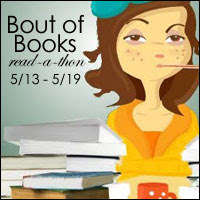 Books to Dream: Bout of Books Read-a-thon! I've decided to take part in my first ever read-a-thon, Bout of Books. The rules are very simple: link up, make a blog post, and read, read, read! This read-a-thon started this morning and will last until the end of Sunday, May 19. This is sort of my intro post with my goals, and on Sunday I will post to reflect how they went. My goal is simple. Read 3-4 books, and finish the two books I am currently reading (included in the 3-4 books to be read). Here are the books I plan to read, though I'm pretty sure I won't get to the last two.